Hei, tänään onkin vilkas päivä, vesijumppaa ja pihatalkoita! Vuorossa hartaita kortteja kolmen kortin keskiviikossa! 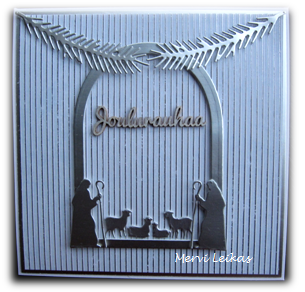 Hi, three nativity cards with Impression Obsession and Sizzix diecuts, wooden Christmas texts and in the third the text is stamped. Patterned paper is First Edition "silent night". 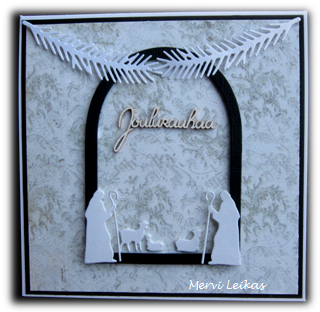 A lovely trio of Christmas cards Mervi. Saw your wonderful card at CHNC Nativity Ch. Like the die cuts you used. Beautiful cards. I love the die cut and that you made three different cards from them. Great work. 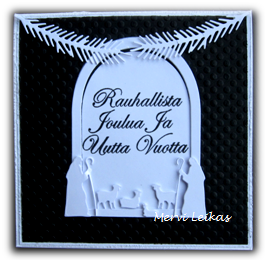 Thanks for joining our die cut/punch challenge at Use Your Stuff this week and hope to see you again. All three of these cards are beautiful! Thanks so much for playing along with our die cut/punch challenge this week at Use Your Stuff! I love the three versions of this card - beautiful!